Clearly, these holidays were made for the sake of having a reason to eat certain things. Not really a fan of chocolate covered cherries. The ones I usually see are on shelves around Valentine's Day, cherry cordials that are an abomination. Don't buy them... please. The chocolate dipped maraschino cherries pictured above, were from a 4th of July years ago. Hill Street Cafe was doling them out and it wasn't bad. 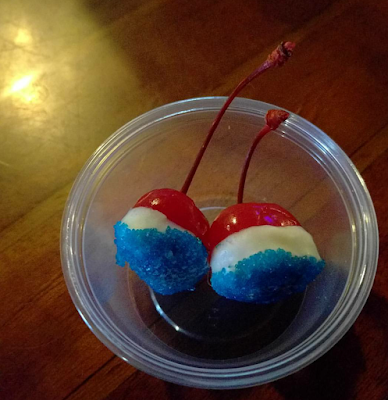 The cherries were soaked in liquor - I think it was vodka. Not saying it was the best thing ever, but it was decent enough for me to think about making them at home. At some point. It only took a few years. Currently soaking cherries in some sake. Will dip them in white chocolate and dust them with matcha powder. And after that, bourbon, dark chocolate, Hawaiian black salt.